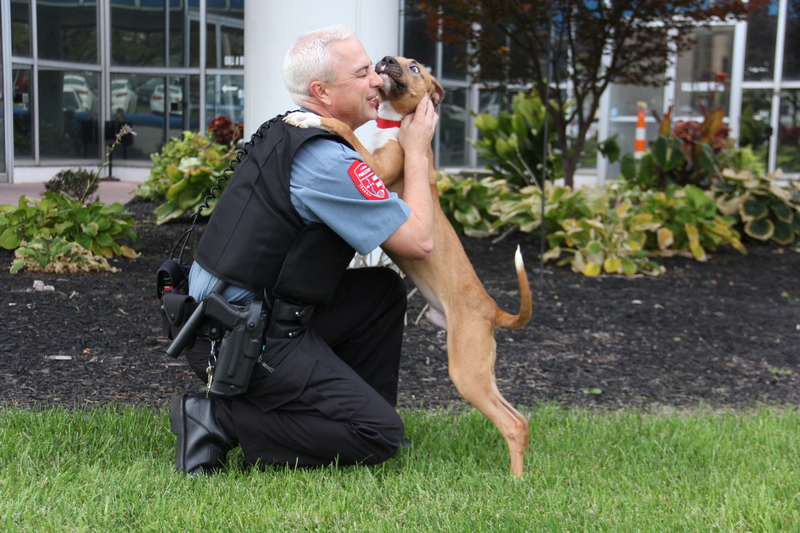 Life is full of surprises, and for Metro Public Safety Detective Jason Powell, one particular surprise came in the form of four furry paws. This week, a stray dog was left tied to a pole near the Union Station MetroLink Station. The dog had been abandoned, and judging by his appearance, he needed a few good meals. A guard at the station alerted Metro Public Safety dispatch, and that’s where Detective Powell enters the story. Powell took the dog to the Stray Rescue of St. Louis animal shelter, but as he left the building, he knew he’d be back sooner rather than later. “I was concerned,” he said. Powell recently experienced the passing of his third dog, and there was an opening available for the right dog to join the family. This dog checked all the boxes. Powell has a five-day grace period with Stray Rescue before full ownership, at which point Stray Rescue will chip, neuter and provide initial training courses — as they do for all dogs adopted at its shelter. Powell said there will definitely be an adjusting period, but he knows the dog will soon become a part of the family and enjoy his new home. Koa is Hawaiian for strong, brave and fearless. That’s quite the fitting name indeed.